EDTS, an Augusta-based information technology and cybersecurity firm, and development firm Cape Augusta Digital Properties marked the occasion Tuesday at Sibley Mill. EDTS signed a 10-year lease in May 2016 on a 32,500-square-foot space in the former textile mill’s historic Cotton Store building. Cape Augusta plans to redevelop Sibley and surrounding property into a high-tech business park called Augusta Cyberworks. Cape Augusta’s plans for Sibley include refurbishing the 135-year-old mill into office space, training classrooms and a 10-megawatt data center to help serve growing cybersecurity needs. Data centers, also called “server farms,” house large amounts of computer equipment and provide power and storage for the IT industry. Sibley sits by the Augusta Canal and is fitted with 2.5-megawatt hydroelectric turbines. That provides electricity to help power a data center’s servers, and water to help keep servers from overheating. Sue Parr, president and CEO of the Augusta Metro Chamber of Commerce, met with Cape Augusta partners in 2015 to hear their plans for Sibley. 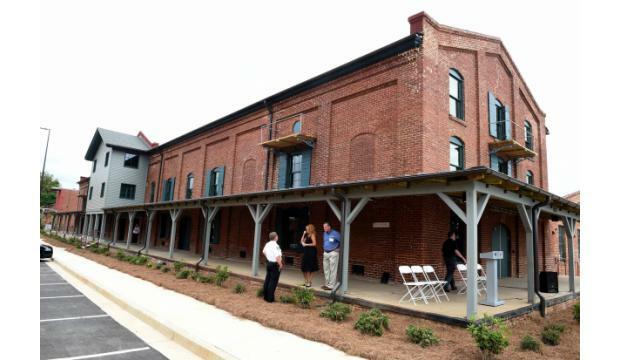 “The interesting part was that they were going to bridge the (mill’s) historical purpose into a new modern use of water and energy, and most importantly make a significant investment in Augusta’s technology future,” she said. Cape Augusta CEO James Ainslie said Augusta “is extremely lucky” to have leadership to help guide the area forward. “Human capital development, skills development and community involvement are absolutely critical to building a sustainable and lasting program in cyber,” he said. EDTS has been working in the recently christened Sibley space for several months. Its founder and CEO Charles Johnson said about 65 employees work in the old Cotton Store, with a capacity for 170. The second phase of renovations will prepare adjacent training space for UMBC Training Centers, a cybersecurity training firm in Columbia, Md. Cape Augusta announced a joint-venture deal with UMBC, a subsidiary of the University of Maryland Baltimore County, in September 2016. Completed in 1882, Sibley Mill produced denim for Levi-Strauss. It sits on the site of the old Confederate Powderworks, the Confederacy’s gunpowder factory during the Civil War. Its obelisk chimney is all that remains of the powderworks today. In 1999 Sibley stopped carding and spinning operations, but continued its denim finishing. The mill closed completely in 2006. The Augusta Canal Authority bought Sibley from Alabama-based Avondale Mills in 2010, and in April 2016 the authority struck a 75-year lease agreement for the property with Cape Augusta.